That’s the tantalizing lipsticked message left on the bathroom mirror by the cold-blooded killer of a woman in Night Vision, a gripping legal thriller that sees linebacker-turned-lawyer Jake Lassiter navigating a tangled web of lies and corruption. Sexual mysteries abound as Jake takes on the role of special prosecutor and discovers that the dead woman’s computer contains clues pointing to the high-tech Compu-Mate network, where lonely people spend solitary nights in steamy talk that can sometimes lead to a rendezvous…or murder. Is a bizarre modem operandi, the only thing linking the dead bodies? The list of suspects includes an alcoholic English professor, a macho forest ranger, a lonely homicide detective and a Vietnam veteran who may be hiding a secret behind his medals. But who is the killer? With the help of a brilliant female psychiatrist with a dark secret in her past, Lassiter follows a twisted path to the streets of London, where Jack the Ripper once roamed. 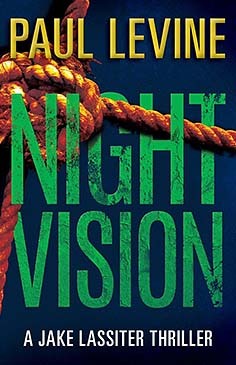 Read what others have said about Night Vision, the second novel in the Jake Lassiter series.